A promising premise, except it's a poorly planned trip that goes nowhere and infuriates with its inadequacies, says Sukanya Verma. Hindi films about girl bonding are in short supply. Most filmmakers are happier pitting them as romantic rivals. In Jia Aur Jia though, two women sharing absolutely nothing in common, except their name, take off to Sweden in a trailer van. A promising premise, except it's a such poorly planned trip that it goes nowhere and infuriates with its inadequacies. Howard Rosemeyer's wobbly direction of Mudassar Aziz's wishy-washy script is a mess past hope and feels like a slog even at 92 minutes. Jia Aur Jia pigheadedly resists telling the story of bright, independent women in charge of their lives despite the possibilities. 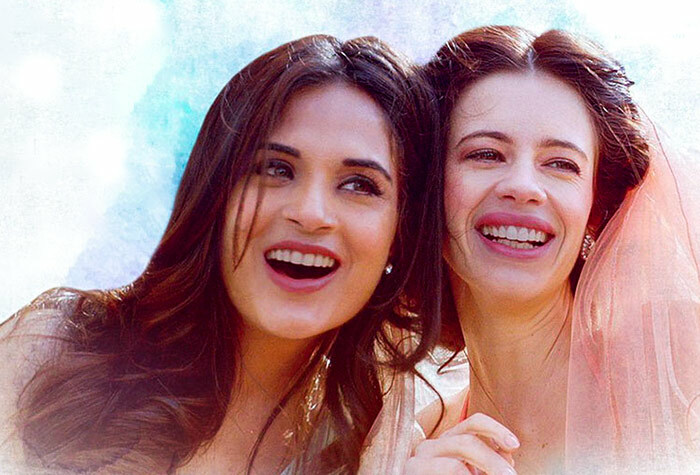 Rather, it starts out like a dull, drab version of Zindagi Na Milegi Dobara's title track highlighting the contrasting personalities, where an overly perky Kalki Koechlin's Jia throws in her stuff into a rucksack while the woefully miscast Richa Chadha's Jia takes her own sweet time to set up her suitcase. They're carrying a lot more baggage than meets the eye, but the stilted first conversation and several more to follow make it increasingly tough for us to care. One Jia is a sassy, sneaky, self-seeking, spirit-guzzling chain-smoker; the other is a grim-faced banker. One makes a crack at the other's scarce smile, the latter remarks about the former's scanty wardrobe. It's as awkward and unfunny as their Victoria's Secret jokes. But when it tries to be dramatic and serious, Jia Aur Jia becomes even more insufferable. Both the Jias carry a dark secret. Let's just say those statutory warnings you see in the movies mean something here as the duo embrace the irony enveloping their names. Public service shorts and insurance policy commercials display more heft than Rosemeyer's insipid celebration of life. What falls flat here is the bond itself. As Jia Aur Jia recklessly trudges towards its live-and-let-die goals, one fails to see the closeness of their suddenly acquired BFF status quo or the shabby love interest (Arslan Goni) thrust into the proceedings out of the blue. That he's called Vasu Bergman is only part of the problem. (Ingmar/Ingrid) Bergman and Absolut (realms of reel dedicated to its promotion) is the most Swedish Bollywood knows anyway. A pity, considering how postcard pretty the country is. But Jia Aur Jia has little interest in showcasing its scenic landscapes, glorious architecture or lively cafes. This same vapid approach dumbs down the talents of Kalki and Richa into pictures of hollow passions and iffy motives. Add to that heaps of blah humour, contrived sentiment and dummy imagination. This journey ends long before it even starts.